I find myself spending hours pouring over the clearance sections of various web sites, and I'll go around, picking out various things, then searching for any coupon codes I can find, and should any good ones turn up (particularly free shipping) I might indulge a little. I might have also indulged a lot today at American Eagle. It started out innocently enough - I've been wanting some stacking rings and they had a set of three for $15.50. 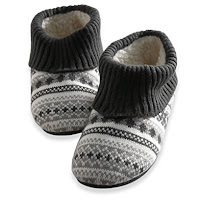 Then, my feet were feeling particularly chilly, and some cute fair isle print slipper booties were on clearance for $10. And just for the hell of it, I stuck this super cute coat in my shopping cart - something that buttons straight up to the top and has a fur trimmed hood -- something that would likely keep me much warmer than my pea coat. 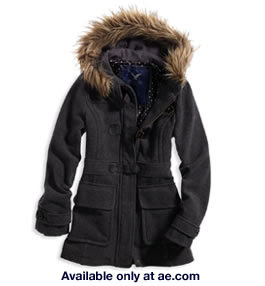 After a bit of poking around, I found a nice %20 off coupon code which made the coat only $48 - such a steal! And that in turn lead to the discovery that there would be free shipping on an order over $100. So at that point it only seemed like the logical thing to do, I mean really, waste $8 on shipping? It would simply be crazy. So that is what happens to me, on the days when I decide to stay in and not go shopping.